Cook it once, eat it twice: tonight’s dinner extras transform into tomorrow’s lunch. That’s thanks to special added ingredients that can easily be heated up, even at the office (your coworkers will be amazed, trust us). 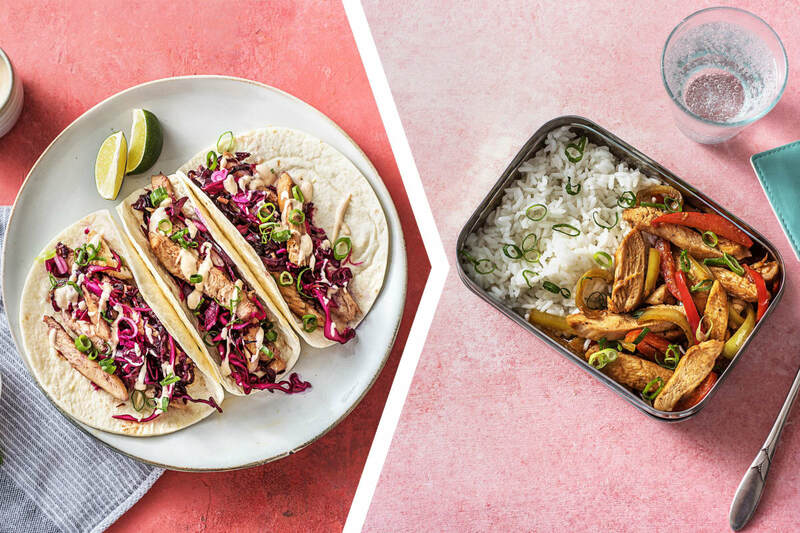 For the first meal, you’ll dive right into a mash-up of Korean and Mexican cuisines with tacos filled with of chicken and cabbage in a bulgogi sauce. The next day, the meat is added to a stir-fry with peppers over rice. Wash and dry all produce. Trim, then thinly slice scallions, separating whites from greens. 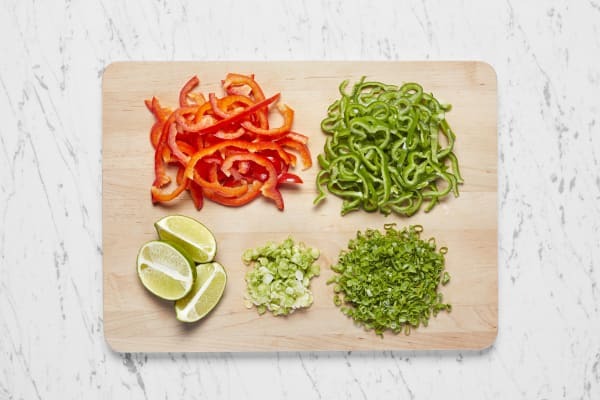 Core, deseed, and thinly slice bell and green peppers. Halve lime, cutting one half into wedges. Bring 1 cup water and a pinch of salt to boil in a small pot. Once boiling, stir in rice. Lower heat to a gentle simmer and cover. Cook until tender, 12-14 minutes. Keep covered off heat until you’re ready to pack lunch. In a medium bowl, combine juice from lime half and ½ tsp sugar. Stir in half the scallion whites and a quarter of the cabbage. Season with salt and pepper. Set aside, tossing every now and then. In a small bowl, combine sour cream and sriracha (to taste). Season with salt and pepper. Stir in water 1 tsp at a time until mixture has a drizzling consistency. Pat chicken dry with paper towels; season with salt, pepper, and moo shu spice. Heat a large drizzle of oil in a large pan over medium-high heat (use a nonstick pan if you have one). Add chicken and cook, stirring, until browned and cooked through, 4-7 minutes. 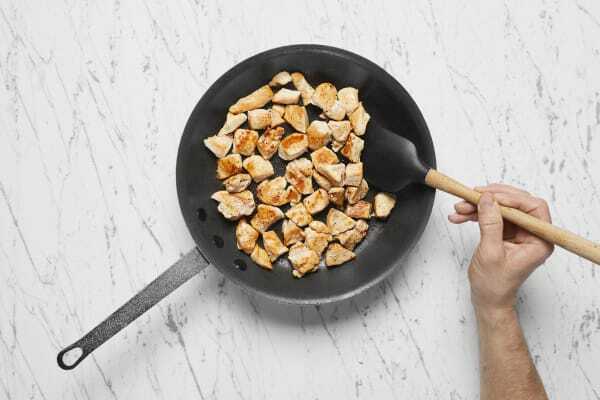 Turn off heat; remove chicken from pan and set aside. Wipe out pan with paper towels. Heat a large drizzle of oil in same pan over medium-high heat. Add bell and green peppers. Cook, tossing, until softened, 3-5 minutes. Toss in remaining scallion whites and cook 1 minute more. Stir in half the chicken, hoisin, soy sauce, and 2 TBSP butter. Transfer mixture to a large bowl and set aside until you’re ready to pack lunch. Wipe out pan with a paper towel. Heat another drizzle of oil in same pan over medium-high heat. Add rest of cabbage to pan. Cook, tossing, until softened, 2-3 minutes. Squeeze in juice of 1 lime wedge. Reduce heat to low, then stir in bulgogi sauce and remaining chicken. Remove pan from heat. Wrap tortillas in a moist paper towel. Microwave on high until warm, about 1 minute. 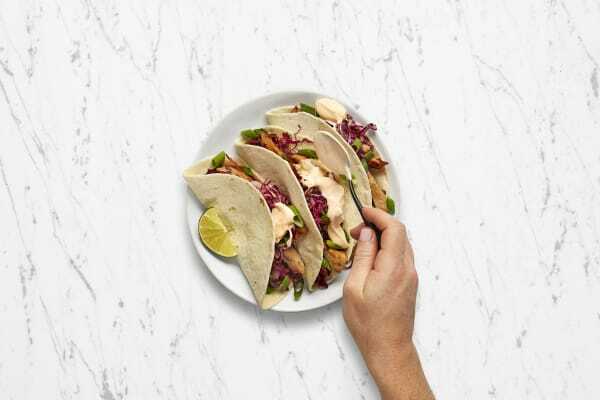 Fill tortillas with bulgogi chicken. 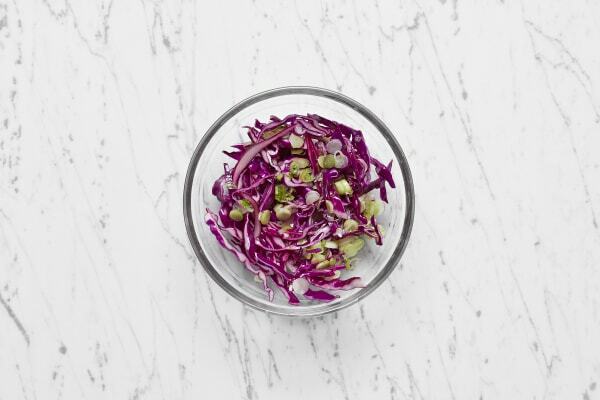 Garnish with slaw, then drizzle with crema and any leftover sriracha (to taste). Garnish with half the scallion greens. Serve with remaining lime wedges. 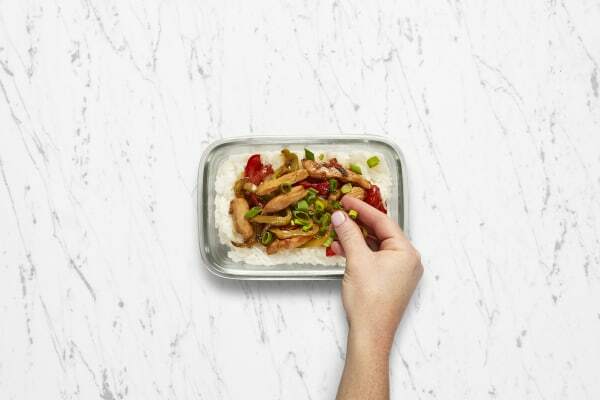 Fluff rice with a fork and divide between reusable containers. 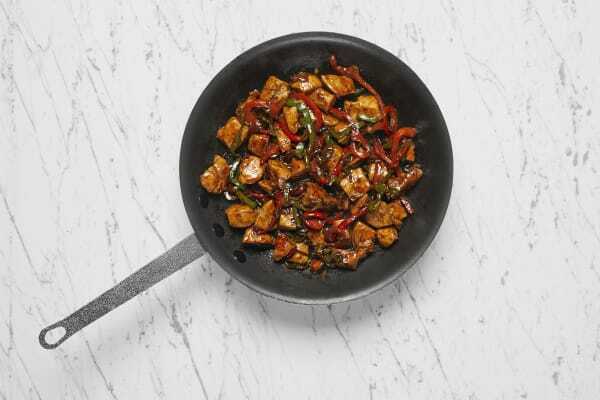 Arrange chicken stir-fry next to rice and sprinkle with remaining scallion greens. Keep refrigerated until ready to eat. Microwave on high for 1-2 minutes before enjoying.